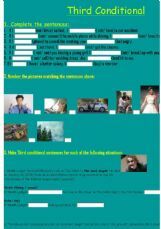 A test on wishes and regrets, vocabulary about films and holidays, past tenses and paraphrasing. 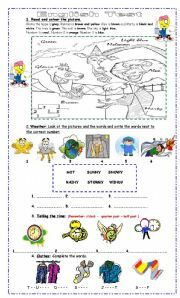 The Format of the exercises are FCE.There are five exercises on two sheets of paper and I have included an answer key. I think it�s useful! 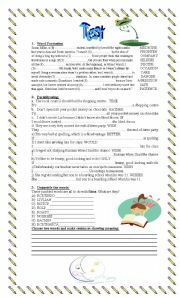 I�ve prepared this worksheet for my students in 2nd adolescents. 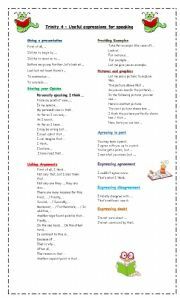 It is to practice tenses,1st conditional, passive voice, adjectives, adverbs, some, any and modals. 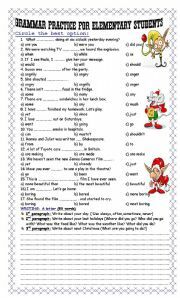 They also have to write a letter using simple present, simple past and going to. Hope you like it!! 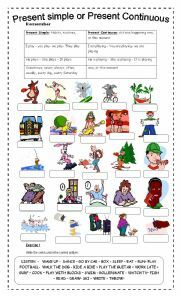 A very nice worksheet to practice past simple and past continuous. Students complete the sentences given. I hope you like it!! 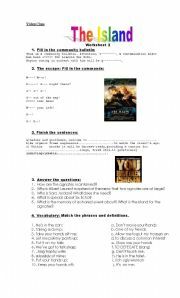 Nice exercises to do while watching the movie or after watching it.I�m using it with my pre-teen students and they love it. Don�t miss it!! 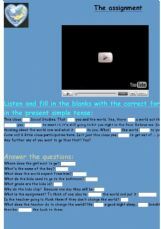 ( vocabulary: personality, jobs,musical instruments , food and camping) Hope you like it!! 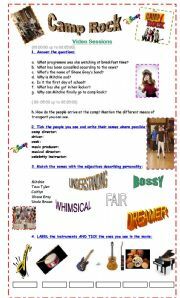 3 pages: 2 pages with great exercises and a page for teachers with suggestions and all the answers! A very simple test for beginners. It�s about colours, weather, time and clothes. Hope you like it. An enourmously entertaining thriller.Ewan McGregor and Scarlett Johansson lead and all-star cast as residents of an isolated, high-tech compound. The topic of cloning is good for discussions. I�m sure your students will enjoy watching and working with this movie. A modern song about the end of a realtionship. 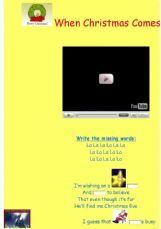 Students complete the song while watching and listening to this song. 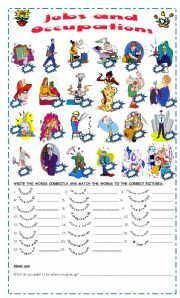 Sing this original song from Speed Racer Movie and search on the web about the characters. Make a poster as a follow up! Have fun! Enjoy this song while watching the video and doing the exercise!Don�t miss it! And I love her ! A classic to teach present simple 3rd person singular while singing! Don�t miss it! The assigment is given to a class: from the movie PAY IT FORWARD. 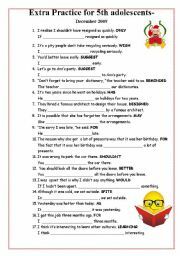 Simple dialogues mostly in present Simple. Good for class discussion. Let�s change the world! Just for kids. A funny way to learn about the dinosaurs in the past and their main characteristics!Hope you like it! One of the most beautiful songs for Christmas time. 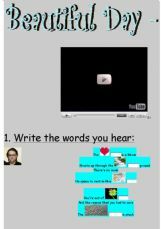 Easy to do and good to sing for the end of the year festival at school!Don�t miss it! For the kid that�s inside YOU!! 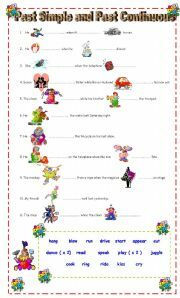 This is an online version of one of my printables about third conditionals. I hope you like it. Nice romantic song to share with your students! Hope you like it!